This post originally appeared on HubSpot's marketing blog. It will only be a matter of time before you are put in a position where you have to hire someone in an area where you lack expertise, or know absolutely nothing about it. Hiring is always a difficult task, fraught with risk. When you add the fact that it’s in an area where you may lack expertise, the risk is even higher. In this case when I talk about hiring, I’m not limiting the action to bringing on employees. We confront this challenge everyday, as our clients must determine what company they will use to support their lead generation and lead management efforts. Our clients often lack expertise in this area (a major reason why they’re talking with us in the first place). So, whether you’re looking to hire a new employee, outsource a function, or simply buy something from a vendor in an area where you lack sufficient knowledge, it’s important that you abide by a process that will maximize the probability of success. Over the years, I’ve made a number of hires in this area and supported clients as well. Here are the 10 tips I’ve developed to increase the likelihood of success. Bob Corlett, President of Staffing Advisors, often finds himself guiding his clients in areas where they lack expertise. He often jokes that it’s easier to make a good hire when you lack expertise because the only thing you can fully understand are the results you desire and you don’t get lost on details and biases you may have about a position. This rule is from the CEO of UDR, Tom Toomey. He says, “I never hire someone new to me to do something that is new to them.” I have to admit that when I heard him say this, I had a “hands to face” moment. I quickly lost count the number of times I had violated this rule, and those hires never worked out. When hiring in an area where you lack knowledge, it’s easy to confuse motivation or desire with competence. A few years ago, we were looking to significantly improve our execution and knew that effective use of technology would be important. We brought someone on board who talked about how to use technology very well. He talked about the need to automate processes and stated the vision we had in mind. He shared his experiences at other companies in the process. What we didn’t confirm was what he did. While he had a clear picture of what was possible, he never actually figured out how to do it. Just because you don’t have experience in an area, doesn’t mean that someone in your company doesn’t; or that an advisor or peer doesn’t have knowledge. No one says your hiring panel needs to be employees of your company. When I was a wealth management advisor, I regularly had to hire people for functions where I lacked the expertise. In this case I wasn’t hiring employees, but various money managers to oversee the investment of my clients. Less than 10% of candidates could answer this question. They would either dodge the question, or insist that this investment was good in all situations. The thing I’ve learned about experts is that true ones know what can go wrong. They understand the causes for failure. They realize there are aspects they can control and others they can’t; and they work like hell to make sure the causes of failure never take hold. Wanna-be’s and poseurs always talk of benefits and success, and can’t talk about what goes wrong, because they don’t know. Here’s the problem with the way most people hire employees or outside vendors. They ask a series of questions and judge the respondent by their answers. From there, they judge whether the candidate has the expertise and ability to do the job successfully. That can work when you have expertise, but how do you judge someone when you don’t have the expertise to understand their answers? It’s actually quite simple. Judge them on the questions they ask you. The right candidate will make you smarter about the function you’re hiring for. The questions they ask to understand your situation and to dig deeper will make you smarter about the role, and about your needs. If the candidate doesn’t ask you questions that you can’t answer, and then enable you to figure out the answers effectively, it’s a pretty good bet you’re not hiring someone with the necessary level of expertise to get your job done. As Thomas Edison is attributed to saying, the real demonstration of knowledge is one’s ability to explain things simply. One of the most famous examples of this was when JC Penney hired Ron Johnson, who had experienced tremendous success with Target & Apple. Fourteen months after he took over, Johnson was fired. How could a hire that was so universally praised, fail so miserably? In hindsight, it is was quite obvious what caused the mis-hire. Johnson had never been a CEO, had never been involved in a turnaround and had no middle-market management experience. Additionally, while he was there, and certainly contributed to success, Johnson was never the one making the calls. JC Penney fell victim to what Phil Rozenzweig calls the “Halo Effect.” The “Halo Effect” is a well-documented mental tendency to assume that, simply because we judge a person or thing to be good in one area or quality, we then assume that they must also be good in other separate, but unrelated areas. Applied to business, Rozenzweig argues that the knowledge of high performance (or indeed low performance) in a company leads us to falsely assume that their culture, systems, strategy and leaders must all share the same performance characteristics as you do. When you’re filling a position or need where you lack the knowledge, you must admit to yourself that you cannot assess a candidate’s competence from conversation alone. So rather than rely on traditional approaches, try something different. As HR strategist Paul Keijzer shares, “using games for recruitment has been highlighted as one of the top 10 HR technology trends by the Society of Human Resource Management for 2014. If you’re not going to implement it, you must at least be aware of it. For example, we’ll often create real-life based practicums to assess a candidate’s ability to do the job. One of our favorites is the “in-box” exercise. The candidate comes in, and we will allocate 2 – 3 hours for the exercise. We give them a computer and a folder with a variety of tasks, requests and communications all based upon the critical skills needed for the position. We then have them go through their “in-box,” and act upon each item as if they were on the job. This way we don’t have to ask them how they would handle something, we see how they actually do it. One of the biggest pitfalls when hiring someone in an area where you lack expertise is that you are more likely to turn away a good candidate or hire a wrong one than you are to make an effective hire, says Corlett. You will get a much, much clearer picture of the capabilities of the other team members. You’ll understand the day to day challenges of the job, and what it takes to do the job well – this will help you avoid “under-hiring” someone not quite good enough to handle it, or “over-hiring”, because again, you’ll actually understand what the job is, and what it is not. You will be able to establish sensible performance metrics for the job, and be far more comfortable holding your new hire accountable to those standards. As McKeown says, you must “know precisely what you are looking for when hiring.” Chief among those is the metrics you will use to judge and measure the candidate you hire. Top performers like to win, and if you’re not clear on the metrics that you’ll use to keep score, you’ll attract the poseurs and repel the right candidates. I see it all the time when companies hire salespeople. They’re big on vision, and weak on metrics. They attract the wrong candidate pool and inevitably make a bad hire. When the metrics are clear, your ability to assess a candidate’s competence is multiplied. Further, if you do make a mis-hire, you’ll be able to more quickly adjust. Hiring for fit is critical when bringing people on board to address an area where you lack expertise. Hiring someone to do something you know nothing about will always be challenging. 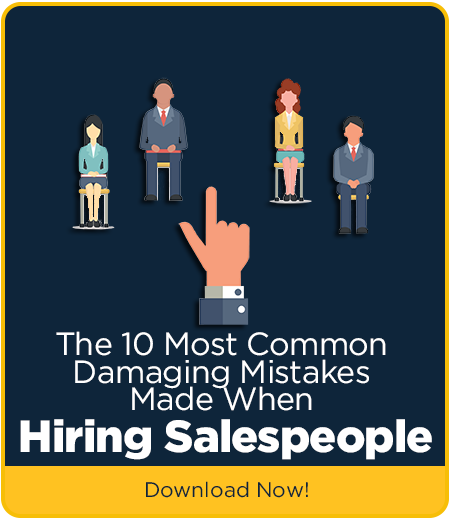 I hope the 10 tips we shared with you here make your next hire a little bit easier. Are there any other tips we missed that you might suggest?